I spotted him getting out of his car in Old San Juan, Puerto Rico. His wife looked puzzled when I walked up and asked if I could photograph him. He agreed without question although clearly he had places to go. I couldn’t get him to smile and didn’t want to push my luck. After all he was nice enough to pose for the photograph. Happy Independence Day to patriots from all nations around the world. 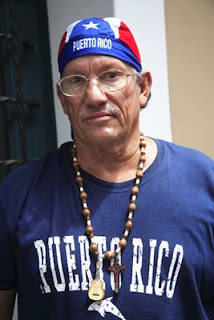 I find that most puerto ricans are extremely patriotic. They are filled with enough PR pride to make a texan take a second look! but they do it in a fun way (not the texan way! ).....they had a PR day in boston and it was a giant party. There is an annual Puerto Rico Day parade in New York as well and millions turn out to watch. It's a lot of fun and also like a huge party.